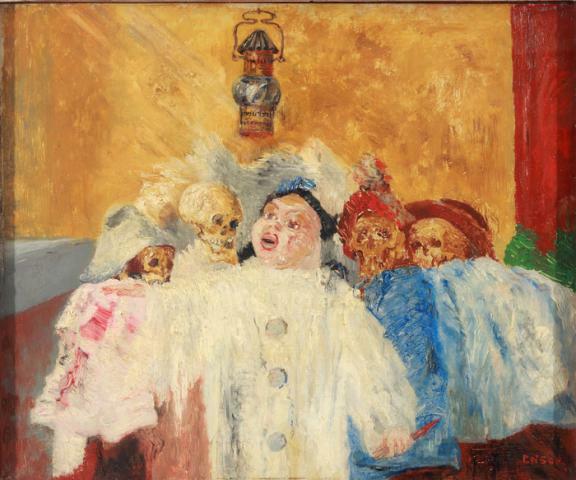 Although James Ensor is primarily linked to his birthplace of Ostend, he also had a fondness for Brussels, and Antwerp played an important role in his life as well. One of Ensor‘s patrons was the Antwerp industrialist François Franck. Franck was also a co-founder of the association for expressive artists and art patrons, L’Art contemporain. KBC Bank Belgium has purchased the nearly complete etchings‘ production of Ensor from the estate of François Franck. An exciting selection is made from this graphic collection for the exhibition, complemented with a few original oil paintings from the KBC-collection. As a bonus, the Plantin Moretus Museum/Print Cabinet of Antwerp is loaning thirteen original drawings and mixed media, amongst which are a few still lifes. For the exhibition, a lovely box was designed with which Ensor‘s love for Antwerp is testified by citations from Ensor‘s letters and addresses.